After some basic analysis, Langie concluded that this message had been encrypted in a dictionary code. Apparently, a dictionary with 10,000 entries had been used. For encryption, the author of the message referenced each of the words with its position in this dictionary. This means that, say, 4049 stood for the 4049th word in the dictionary. Using this proportion table, one can conclude that, say, the number 5761 in the cryptogram probably stands for a word starting with N. ???? HAS SECURED A VALUABLE PIECE OF INFORMATION INREGARD TO THE COMING ENEMY OFFENSIVE. I HAVE BEEN REQUESTED TO SEND HIM FIVE HUNDRED POUNDS. IT IS A GOOD OPPORTUNITY TO DENOUNCE HIM. DO SO, AND YOU AND I WILL DIVIDE THE SUM BETWEEN US. There’s no doubt that Langie’s solution of the dictionary cryptogram was an ingenious act of codebreaking – at least, if this story is real. To my regret, there is no way to verify, if this is really the case. I don’t know of any other literature source that mentions this codebreaking success and that confirms that it actually happened. I wouldn’t be surprised, if the whole story was a fake. While I can’t verify Langie’s report, I certainly can create a similar cryptogram. This is what I did. First, I looked for a text file containing the 10,000 most popular words of the English language. 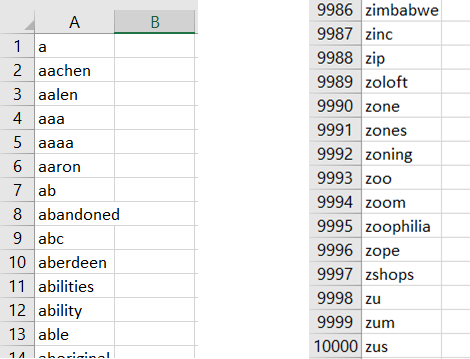 Next, I sorted these words alphabetically (using Excel). 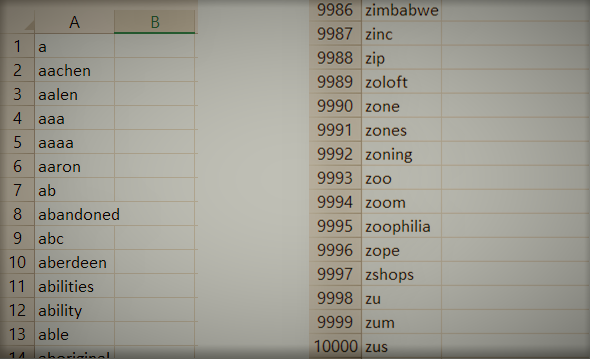 Finally, I used the resulting list as a codebook, with each word being referenced by its position in the list. The word list not only contains full words and some abbreviations, but also the 26 letters of the alphabet (they are treated like ordinary words, which means, for instance, that E stands between DYNAMICS and EACH). If a word one wants to encrypt does not appear in the dictionary list, it can be encoded letter by letter. Can you solve this cryptogram? If so, you might be as skilled as one of the best codebreakers of his time. If noone can solve this challenge, this raises further doubts whether André Langie’s codebreaking success was real. Yes, this ending is correct. @Norbert: Phantastic! This solution is (alomost) correct. START AT THE OAK TREE NEXT TO CAMDEN BRIDGE THREE KILOMETERS SOUTH OF THE POWER PLANT FOLLOW THE ROAD OVER THE BRIDGE AFTER ABOUT ONE KILOMETER TAKE A LEFT AND WALK ALONG THE WALL AFTER SIX HUNDRED METERS YOU WILL REACH A MALL IN THE CENTER OF IT THERE IS A STONE CROSS ON THE REAR SIDE OF IT YOU WILL FIND A WOODEN CASE CONTAINING A DICTIONARY THAT WILL HELP YOU TO DECRYPT THE NEXT MESSAGE. In fact, I added a few dozen words throughout the list and deleted as many. 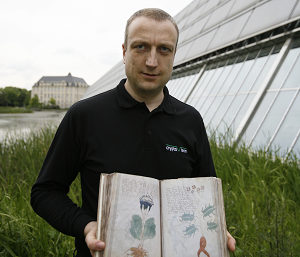 Nevertheless, Norbert correctly identified almost all words in the ciphertext. Great job! This is a sound approach when an alphabetically ordered dictionary is used. In addition to Yardley (as mentioned by Thomas), it is said the technique was described by D’Agapeyeff (see my article). I didn’t know Langie’s example. I will update my page some day.